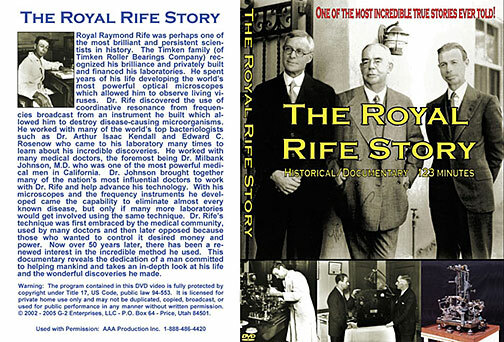 Dr. Royal Raymond Rife Original Audio Library - Hear Dr. Rife In His Own Words! The Complete Rife Video and Audio Library. 2 DVDs and 10 Audio MP3s. 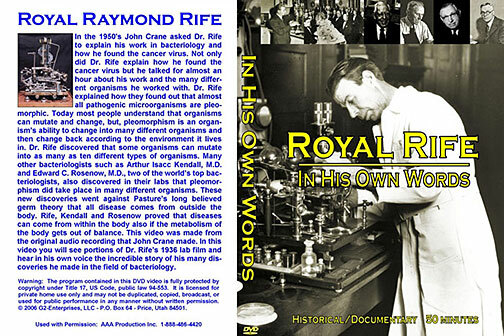 The definitive documentary regarding the complete history of Dr. Royal Raymond Rife. 1 DVD - 2 hours. Dr. Rife talks about his life and achievements. 1 DVD - 50 Minutes. audio library from the John Marsh Collection. This audio archive library is for educational and historical purposes only and are not to be construed as medical advice or to lead anyone away from a doctor. Dr. Royal Raymond Rife was perhaps the most brilliant and persistent scientist in history. What follows is a brief description of how Dr. Rife developed this remarkable technology. Where technology didn't exist, Dr. Rife invented it, such as the first micro-dissectors, micro-manipulators, and heterodyning ultraviolet microscopes. Dr. Rife won 14 government awards for scientific discoveries, and a medical degree (hon.) from the University of Heidelberg. Millionaires like Henry Timken (owner of Timken Bearings) financed Dr. Rife's work. Hearing Dr. Rife in his own words is very powerful and educational. We are now making available a set of re-mastered Audio tapes on Compact Disc. Most of the tape hiss has been removed using the latest computer software. This set is taken from the original John Marsh collection of Reel to Reel tapes. The Audio restoration is Copyright 2003. On these CDs you will hear Dr. Royal Raymond Rife with Dr. Robert P. Stafford M.D., John Marsh, Dr. James B. Couche M.D., John Crane, Dr. Tully D.D.S., Dr. Gonin M.D., Henry Siner, Ben Cullum (a friend of Rife), and Dr. Fite. MP3-1 Dr. Robert P. Stafford M.D. 1:08:00 Dr. Stafford's evaluation of Dr. Rife's frequency instrument after 18 months of use. MP3-3 1. Dr. James B. Couche M.D. 59:48 Dr. Couche tells John Crane about his 22 years of using Dr. Rife's frequency instrument. 2. Dr. Royal Rife 8:49 Dr. Rife talks about the BX virus and the 1934 clinic. MP3-4 1. Dr. Tully D.D.S. 29:36 Dr. Tully tells John Crane about his successful use of Rife's frequency instrument. 2. Dr. Tully D.D.S. and Dr. Rife 36:41 Dr. Rife and Dr. Tully talk about e-coli, cancer and ray tube. MP3-5 1. Dr. Gonin M.D. and Henry Siner 41:21 Dr. Gonin talks about the microscope he bought from Rife. Siner talks about his trip to England, Rife, Timkin and BX virus. 2. Dr. Rife 35:37 Dr. Rife talks about electron therapy, Kendall, Rosenow, and 1934 clinic. MP3-6 1. Ben Cullum 1:00:06 Ben Cullum talks to John Crane about his friendship with Rife, building of first microscope, Beam Ray trial and Mrs. Timkin. 2. Dr. Lara and Dr. Rife 19:11 Dr. Rife talks about various infections. MP3-7 1. Dr. Rife, Stoudard and Dickland 41:46 Dr. Rife talks about how frequencies work, 20000 cancer tissue sections and BX virus. 2. Dr. Rife and John Crane 24:30 Dr. Rife talks about harmonics of frequencies, killing organisms, and microscope magnification. MP3-8 1. Dr. Rife 56:10 Dr. Rife talks about his methods, cancer, tetanus and leprosy. 2. Dr. Rife and Dr. Fite 7:29 Dr. Rife talks about the BX, BY and Universal Microscope controls. MP3-9 1. Dr. Rife and John Crane 58:17 Dr. Rife and John Crane talk at great length about the Universal Microscope. Rife Audio Library includes over 11 hours of .MP3 archives on one CD! as well as all Windows PC and Mac computers. Order the entire library, 2 DVDs and 1 MP3 CD for 1 low price! $69 plus $6 shipping and handling! Copyright © 1996-2014 EMR Labs, LLC. All rights reserved.